Don't you just hate it when some people don't listen to you? To me, time is important and most of the time, I do my best to keep track of it especially on a busy day. This month until January will probably be the busiest months for me. Not simply because the holidays will be here soon but rather there are so many things that I need to be doing on the following months. Aside from the fact that I need to talk to our landlord for the moving arrangements, we also need to do some packing and moving. I also need to update my SSS - for my new address and my MAT 1. There is also the fact that I need to have our Globe subscription disconnected or perhaps transferred - whichever we will decide to do. Lastly, there is the issue of my employment. Perhaps I need to talk to the management as early as now to have an agreement with them. I am no longer expecting to be regularized. I just want them to consider my situation and let me stay until the end of January so that they will be able to pay their share of the Philhealth and SSS while I do the rest. Yes, busy, busy, busy. I told you so. Today is a busy day as well. I woke up early and programmed my mind to do all the things that I have to do today. I made a list of things that I should be doing today and even made a timetable for it. I am more systematic that way. So far, I have already done some of the things on the list. 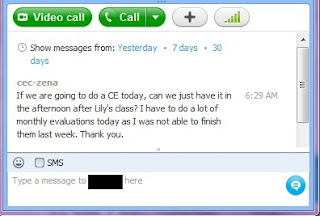 I also informed my GL that if she needs to meet me to talk to me, she can do it at a certain time. Giving her my free schedule was on my priority list. Unfortunately, she wasn't listening or reading when I did it. *SIGH* I don't understand why some people would be like that? Then, they would blame you for not saying anything when in fact you did? I don't like it when my schedule gets changed just because of somebody else's incompetence and neglect. I am doing my part. Shouldn't others be doing theirs as well? She said she has something important that she needs to tell me. I said okay. I just hope that that something important, truly is important. Knowing them, everything is important even a measly detail of something so trivial can be important. To me, it isn't. I am like a horse with covers on the sides of its eyes. I only see what I should be focusing on and do not stray away from it. Maybe I am really surrounded by young people as most of them probably need more direction than I do. Not saying that I am better than them. Just saying that I know my priorities more than they do. I listen. I always do. Especially when it comes to work. Sometimes, I honestly don't want to listen anymore because as I said trivial things don't really matter. Blah blah blah! I know they all have good intentions and they all want to improve themselves and the company but how can they do that if they don't really know what matters? 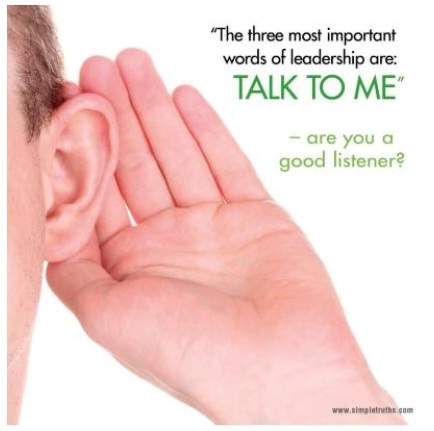 How can leaders lead if some of them don't even know how to listen? Leaders aren't supposed to be all talk. They should be role models to their members as well. I follow and don't question much even if I know I must. Maybe this is because I don't want them to think of me as a defiant employee who doesn't care about them and their so called rules and regulations. 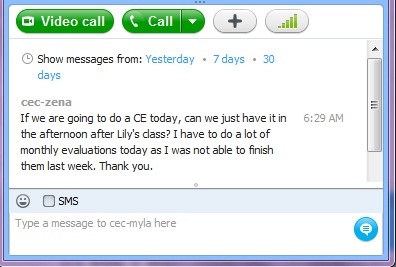 I am not after confrontations at the moment as all that matters is I work because I have to and I need to. I don't see anything else that would matter aside from those reasons. Anyway, the day is still young and I know I have a long way to go so I must endure the day as it passes by, hoping that whatever news my ears will be hearing later on, won't be bad news. As I am sick and tired of hearing them. Monday Blues? Yes, I currently have them but I am not complaining and just doing what I should be doing today. I'm a grown woman so I'm sucking it up. Wouldn't you do the same as well? A good leader listens to his/her members. That is a no brainer. You don't need any leadership training to know that. That is common knowledge. It doesn't matter if you have had leadership experience or not.